I always know when a movie will make me cry, starting as a deep swelling in the chest. The throat tightens up, the joints go loose, and soon the hot drops drip down the cheeks. If a movie is good, or particularly manipulative, I’ll cry where it wants me to: the sweeping climaxes, the heroic sacrifices, the tragic losses. But truly great films keep my waterworks primed for their entirety. The last time I cried my way through a film was Sylvain Chomet’s The Illusionist (2010), an animated adaptation of an unproduced script by Jacques Tati, that great genius of French comedy. The whole film was suffused with such melancholy sadness and beauty that the weeping started barely five minutes in. Before that was Ingmar Bergman’s Cries and Whispers (1972), one of the most agonizing examinations of human suffering and selfless kindness I’ve ever witnessed. Before that? Well, that’s a story for another day. Now I sit here trying to gather my thoughts on Jin Mo-young’s My Love, Don’t Cross That River (2014), a South Korean documentary that became one of the nation’s greatest sleeper hits. 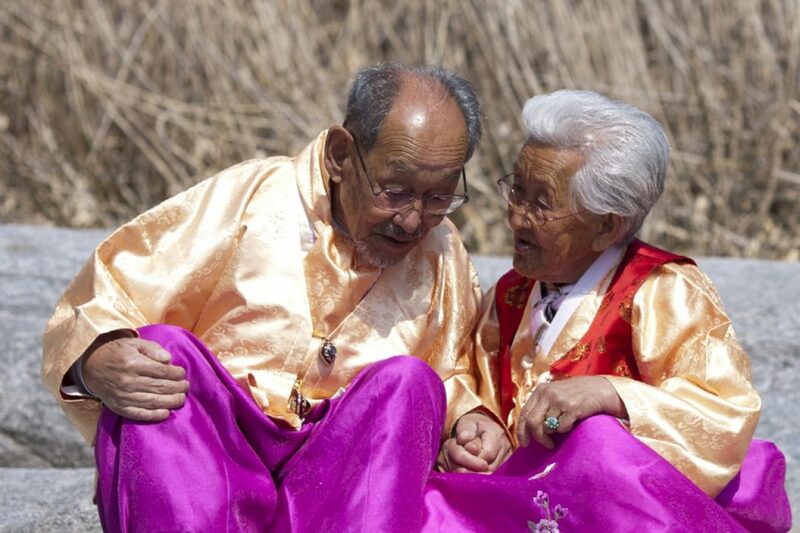 Inspired by a short television segment on the marriage between 98-year-old Jo Byeong-man and 89-year-old Kang Kye-yeol, Mo-young traveled to their rustic village in Hoengseong County, Gangwon Province with the intention of capturing their lives on film. Over the next 15 months he would unwittingly capture the final days of their 75 (“maybe 76”) year marriage, Byeong-man slowly succumbing to an unnamed illness. We know this from the very first shot of the film: Kye-yeol weeping in a snow bank next to her husband’s grave. The tears didn’t truly start until the next few scenes. First we see them sweeping up dead leaves, Byeong-man suddenly throwing double handfuls of them at Kye-yeol like a schoolboy (now comes the swelling). Then he picks her a handful of yellow flowers. She wipes them on her face, savoring each petal (now the tightening). They eat a simple dinner of greens and fish and reminisce on how they’ve never gone hungry during their marriage (now the loosening). Finally, their grown children and grandchildren arrive, bowing and hand-feeding them cookies and lavish snacks. And the tears come, quick and free, where they will stay for the remainder of the film. My Love, Don’t Cross That River is a collection of little moments of love, joy, and loss—of impromptu snowball fights, of traveling to a senior center on a Technicolor party bus, of struggling to keep the peace when the children get into a terrible fight about filial piety and responsibility at Kye-yeol’s birthday party. Sometimes Mo-young keeps the true intentions of a scene secluded until they break apart upon the audience with an overwhelming ferocity. We see Kye-yeol buying six pairs of long leggings for her six children, happily chatting with the store clerk as she peruses shelves of bright blue and pink fabrics. But back at home we learn that she bought them not for her six surviving children, but for the six that had either died in childbirth or in their youth. Times were hard when she first had them, she remembers. When the Korean War came, she couldn’t afford her children such extravagances as pretty Hello Kitty leggings. Later, we watch as she burns them in a fire along with a new hanbok for Byeong-man to wear in the afterlife. Take these to our children, she entreats. And wait—I’ll be with you soon. Someone once said that the more universal you try to make a story, the less universal it becomes. Only by exploring the specifics do you catch a glimpse of the catholic. My Love, Don’t Cross that River takes us by the hand and welcomes us into the lives of two simple lovers living in the Korean mountains. They wear matching hanboks, admire Chinese orioles, and chuckle over the midnight liaisons of the local reverend’s dog. And yet you cannot watch the film without realizing that you are watching an eternal story, played out millions of times and destined for even more. Mo-young tears away at the fabric of their little lives and discovers the whole of mankind. Previous ArticleAlbum Review: Red Hot Chili Peppers - "The Getaway"
Next ArticleWhat Do We Know About "Pretty Little Liars" Season 7?